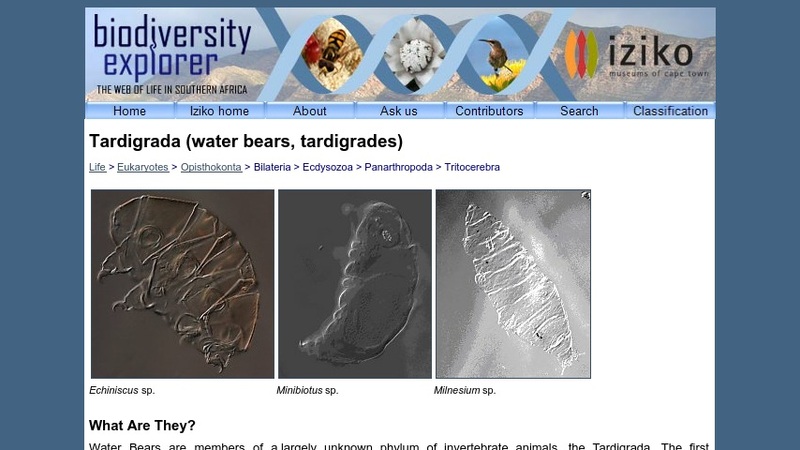 This web page describes water bears, minute animals that can remain dormant in a dry state for over 100 years. The page addresses what they are, where they are found, their general biology, cryptobiosis, their ability to resist environmental extremes, implications and further research regarding their cryptobiosis, where they fit in with other animals, and their existence in South Africa. It also describes how someone could collect and see them. The page is part of Biodiversity Explorer, a web site hosted by Iziko Museums of Cape Town that features the diversity of life in South Africa.